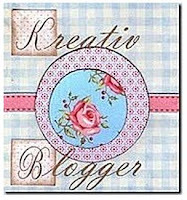 Diane was kind enough to send me this "Kreativ Blogger" award... (And I, too, am curious as to why they spelled "Creative" that way...) Thank you, Diane! 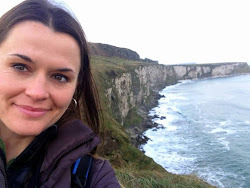 I don't know Diane personally, but I have enjoyed getting a little glimpse into her life and artwork through her blog. Be sure to stop by and check it out... she has some wonderful things on there! A side note: whenever I do one of these, I try to nominate people I've not nominated previously - that gives you a chance to see more great blogs, and keeps me from becoming a pest handing these things out... As always, if you are one of my nominees, you should in no way feel obligated to participate or pass this along unless you'd like to! I just admire your work and wanted to share it with my readers! 1. I am not very athletic. At all. Which is one reason why I paint, I guess. I do like a good game of racquetball, however. 3. I like dipping green beans in applesauce. The green beans have to be warm and the applesauce has to be slighly frosty. Both have to be home-made/grown. Don't knock it 'til you try it. 4. I am allergic to synthetic chemical fragrances. I can't have candles, air fresheners, plug-ins, perfumes, or potpourri in my house, or I wind up with sinus infections and a cough that won't go away. I'm sure you wanted to know that. 5. I started keeping a list of books that I've read throughout my life when I was in junior high or so. I wrote down every book I ever remembered reading at that point, and have written down every book I've read since (excluding text books). I'm currently reading # 530. However, I still don't wear a plastic pocket protector, so maybe there's hope for me yet. 6. I hate dealing with any type of governmental paperwork. But I do it, because, you know, it's the government. Probably more than you wanted to know... esp. #4. #3 is a tossup. Anyway, thanks for reading. Thanks again, Diane, for this award! I am truly honored and humbled to know that you enjoy my blog! Hello, Beth! What a lovely surprise to receive an award from you and to find myself nominated with such creative artists! And I just LOVE your commissioned piece of that cute Bernese Mountain puppy! I always love those tidbits about people. Stuff you'd never know if they didn't tell you, or if you don't hang out with people. Adds depth and color to people. I also really like those buttons on the right of your blog page here. Did you design those? Thanks for the compliment on my buttons too. Yes, I did design them. Found a pretty simple tutorial online on how to create them and make them work. Just google "make buttons for your blog" and you can learn how to make them. I made the images in photoshop, but any photo software would work. You can even edit them on a site like photobucket. Ok, Beth...green beans in apple sauce as a favorite treat? Maybe I'd put...oh...twix bars in chocolate or something along those lines!!! LOL This was great fun to read. I am amazed by your talent. I too keep a list of all the books I've read. Hey, I have a question...what is the blog set up you use? Mine is all compressed on the right and left margins, but yours is nicely spread out. Thank you so much Beth! I am sooo touched and delighted! Thanks so much Beth! I enjoyed reading your random facts. I like dipping french fries in frosties. I haven't eaten those in a long time, but it was one of my favorite flavor combinations. i enjoyed my visit to your blog and i will come back because i am interested in any blog that mentions dust bunnies :-) seriously, you have a lovely blog.